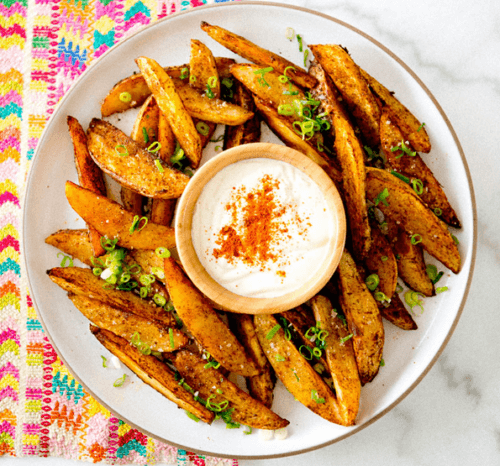 These zesty potato wedges take snacking to a whole new level.Most vegans are not afraid of potato wedges. I feel so bad for my meat eating friends who are trying to lose weight and depriving themselves of potatoes. Meanwhile I will often make an entire meal of nothing but potatoes! If you read that first paragraph and thought I was crazy then let me recommend Dr John McDougall to you. He is a well know doctor and vegan. He is also the author of “The Starch Solution” and it details why we should be eating starches. If you eat the correct foods then weight generally isn’t a problem. I can tell you that my weight started dropping effortlessly when I went vegan. And in a healthy slow way. I was eating more food than ever before and losing weight! Meanwhile my friends were cutting out tasty foods like potatoes and bread from their diets and being miserable. 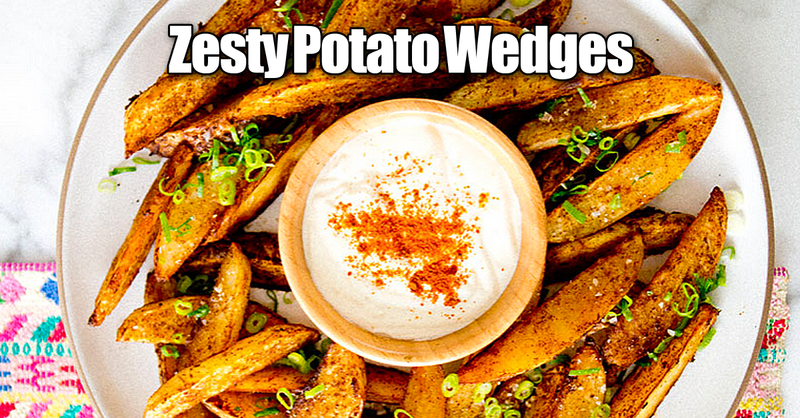 How about this recipe for zesty potato wedges. It is really easy to make, has a ton of flavor and of course it is completely vegan. And yes, they are just bigger fancier french fries, let’s be honest. I can sit down and eat a plate of them with nothing else. But you could also include other vegetables, soups or salads to make it a more complete meal for you. A little tip for the dipping sauce. Make it ahead of time and let it chill! A house in the hills is an awesome website and they are where I found this delicious treat!